Copa América (English: America Cup; previously called the South American Championship or South American Championship of Nations) is a tournament that has the teams from CONMEBOL (South America). It was founded in 1916, and it is the oldest tournament that only has teams from a certain continent. The Copa America is one of the most watched sporting events in the world. The winner of the tournament goes to the FIFA Confederations Cup. The current format has 10 South American teams and two other teams from other FIFA federations in each tournament. 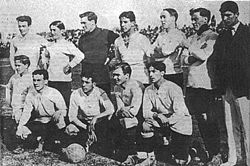 The most successful team has been Uruguay, with 15 titles. Chile won the last tournament. ↑ "Argentina 0, Chile 0 (4-2, PKs)". Copa America Centenario Final Recap. 26 June 2016. Retrieved 5 July 2016. This page was last changed on 10 January 2019, at 10:36.